Last year, I wrote a series on this blog about the characteristics, performance, and practical applications of Nexabond, an excellent cyanoacrylate glue formulated specifically for woodworking. Since then, the developer of the glue, Sirrus, Inc., has entered into an exclusive licensing agreement with DAP Products, Inc. The Nexabond 2500M (medium set time) formulation in now marketed as DAP RapidFuse Wood Adhesive. The product is no longer sold as “Nexabond.” The slow (“S”) and long (“L”) set Nexabond formulations, which were less useful and less popular, are no longer available. 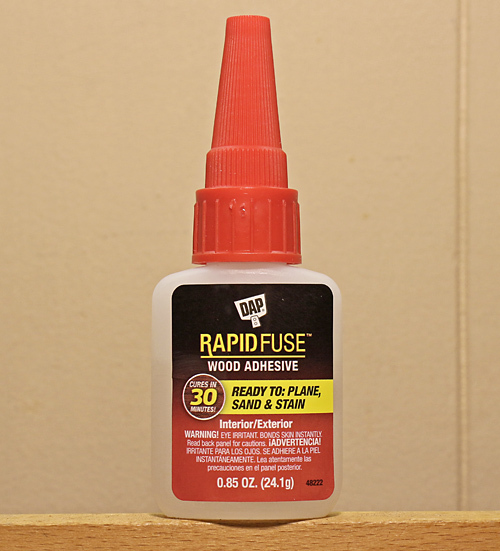 DAP RapidFuse Wood Adhesive is sold in .85-ounce (about $6) and 4-ounce (about $10) bottles. It is widely available, including at Home Depot, Lowe’s, Ace Hardware, and True Value Hardware. The shelf life of Nexabond 2500M was pretty short in my experience with it – a year at best, and maybe even 8 months or so in a warm shop, as I recall. DAP also markets RapidFuse All Purpose Adhesive, which, according to Sirrus, is also the Nexabond formulation. I do not know how or if the “All-Purpose” differs from the “Wood” version. The very same technical bulletin shows up on the DAP website for both products, and the listed applications are essentially the same. I suspect the two differ, for marketing, in name only. In that case, either could also be used in the shop as an all-purpose CA glue. Interestingly, Home Depot and Lowe’s currently sell the Wood version for 50¢ more than the All-Purpose in the .85-ounce sizes. It is good news that the Nexabond formulation is once again available. It is a very useful glue for woodworking. It is a steady performer in my shop. The nozzle will quickly get plugged with dried adhesive so I ream it clear with an 18 gauge nail (protruding from a wood block) before putting the cap back on after each use.